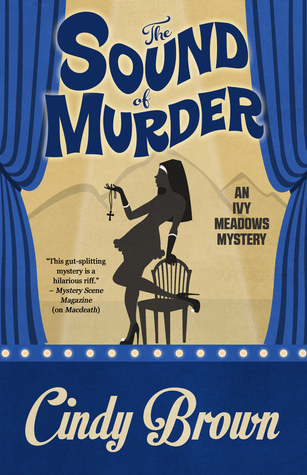 Following up her big debut in MacDeath (see my review here), Ivy Meadows … actor and investigator … has a role in the new show, The Sound of Cabaret – a mash-up of The Sound of Music and Cabaret. But in her role with her uncle Bob’s detective agency, Ivy (real name Olive Ziegwart) has a more difficult task … to determine whether or not the recent rash of suicides is actually the work of a serial killer; to catch the killer or solve the reason for all the suicides. She also has to find a place to stay after setting her apartment on fire; to find a car to drive, after setting her car on fire; hold on to the hot fireman she’s started dating (at least something good has come from the fires); and prepare for the opportunity to perform in front of a producer who could get her to Broadway. But as much as Ivy wants to be an actress, she also wants to work as a private detective with her uncle’s agency and uncle Bob has given her an assignment. As she’s trying to canvass a neighborhood and knock on some doors, she realizes how much her uncle Bob Duda needs to change the name of the agency — telling people she’s with Duda Detective Agency closes nearly as many doors as it opens. This is a light murder mystery and author Cindy Brown appears to be having a lot of fun – certainly we are, reading this series. The exploits of a small theatre organization are pretty much spot on, and it’s evident that Brown has had some experience working in amateur theatre. But once again, where Brown shines the most, is in her characters. Quirky and a little bit loony, everyone is just a little bit over-the-top, and yet somehow very real as well. We can easily recognize everyone here and have a chuckle at the way they behave, but we do it because we know it’s true. And while it might seem unrealistic that Olive would so easily believe in the things she’s being told in regards to her possible future on stage, given her wits and wile, it is very realistic that people often believe what they want to be true. I enjoyed this book a bit more than the first one in the series. Ivy/Olive is becoming a little more developed as a character and I enjoyed seeing her work hard at the detective work. I also very much liked her relationship and I hope we’ll see more of this in future books. And one of the real charms to this series so far is the outrageous fun author Cindy Brown is having with theatrical ventures. First there’s a Macbeth in a circus setting, and now there’s a unique musical, combining The Sound of Music and Cabaret (at least there are Nazis in both of the original shows). I look forward to more of this playfulness and to the continued growth of Ivy in future installments. Looking for a good book? The Sound of Murder, the second book in the Ivy Meadows Mysteries by Cindy Brown, is a fun murder mystery that will entertain while you try to figure out whodunnit.